This view of the Station wildfire in La Canada Flintridge was taken on Aug. 28 by astronomer Mike Brown from the library at Caltech. The images is looking northeast toward downtown Pasadena and JPL in the dip in the mountains. Thewildfire raging in the forests near NASA's Jet Propulsion Laboratory inPasadena, Calif., intensified on Saturday, edging closer to the researchfacility. Theso-called Station fire isburning in the Angeles National Forest near homes on the northside of LaCa?ada Flintridge, according to news reports. The fire came within one quarterto one eighth of a mile of JPL, but does not pose any immediate danger, saidNASA spokeswoman Jane Platt. AstronomerMike Brown of Caltech snappeda picture of the fire's smoke plume on Friday, from the 9th floor of theCaltech library, looking northeast towards downtown Pasadena and JPL. Thepicture was taken when the fire was still about 2 milesaway from JPL. JPLis closed to all but essential personnel right now. Whether it will remainclosed on Monday has not yet been decided. "JPLis continuing to monitor the fire and the air quality, and a decision will bemade sometime after 2 pm today (PDT) on whether JPL will be opentomorrow," Platt told SPACE.com. Askedwhether the fires were affecting any current research or mission work, Plattreplied, "I'm not aware of any effect on missions, including efforts to'Free Spirit.' Keep in mind much of the fire activity took place over theweekend, when we normally have reduced staffing anyway." 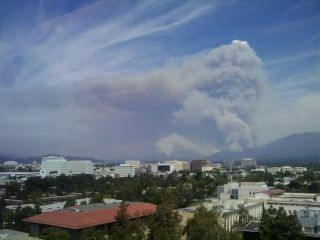 Thefire has affected JPL in one way though, through the employees who have had toevacuate theirhomes. As of late Saturday, 20 employees had had to evacuate, Platt said. Can a Wildfire Ever Put Itself Out? Should Wildfires Be Fought So Aggressively?